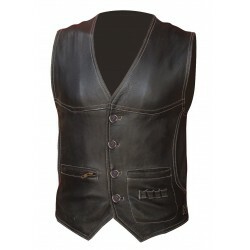 These quality vests are made of soft sheep nappa leather. Standard western style with two pockets on the front with Colour stitching. One pocket on the back side with one buckle on the side for adjustable. Most of our items can however be made in different colours and sizes. please do not hesitate to contact me if you have a special requirement as i am always happy to assist. This product is made from Sheep Nappa Leather.